Then-Vice President George H.W. Bush meets with members of a commission set up in 1986 to probe the operations of the National Security Council staff in the wake of the Iran-Contra scandal. 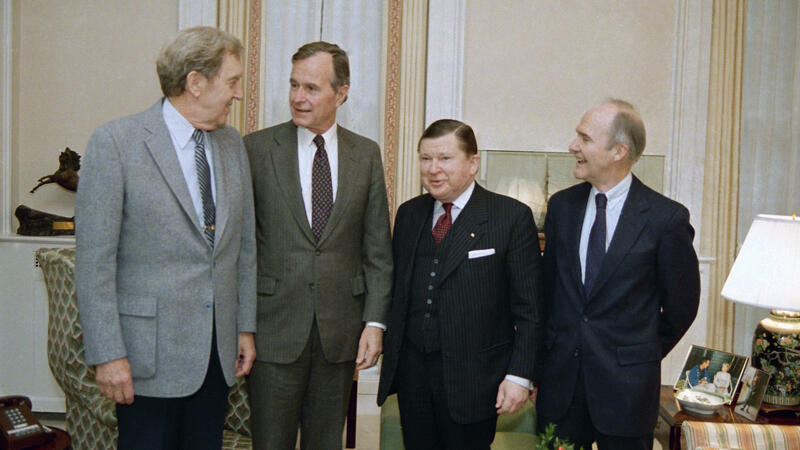 Pictured are former Secretary of State Edmund Muskie (from left), Bush, commission chairman John Tower and Ford national security adviser Brent Scowcroft. Largely missing from the flood of remembrances of the late President George H.W. Bush is the role he played as Ronald Reagan's vice president in what came to be known as the Iran-Contra Affair. It's an episode that clouded an otherwise remarkable career in public service. Perhaps Bush's most well-known involvement in the affair was his absolution of some of those in the know about it. On Christmas Eve of 1992 — seven weeks after losing his bid for a second presidential term to Bill Clinton — Bush pardoned six members of the Reagan administration who had been charged with crimes including perjury, lying to Congress or obstruction of justice. All those charges stemmed from attempts by senior Reagan administration officials to cover up a covert White House operation whose disdain for established law and outright deception marred Reagan's tenure. The scheme, which unfolded over a two-year period beginning in late 1985, started with illegal arms sales to Iran. Selling weapons to Tehran, which was at war with Iraq at the time, had two objectives. One was to enlist Iran's assistance in freeing American hostages being held in Lebanon. Among them was William Buckley, the CIA station chief in Beirut. Buckley was ultimately killed by his captors, though other hostages were released. In turn, profits from Iran's purchase at highly inflated prices for the weapons — which were routed through Israel — were used for the scheme's other objective: buying arms for anti-communist rebels known as Contras who were fighting to topple the elected Marxist government of Nicaragua. Those weapons purchases were done in defiance of a congressional ban on aid to the Contras. Bush's grant of pardons came 12 days before Caspar Weinberger, President Ronald Reagan's defense secretary, was to go on trial. Weinberger had been charged with obstruction of justice and lying to Congress about the arms shipments to the Contras. The focus of that trial was to have been a private notebook of Weinberger's that contained references to Bush's knowledge of the illegal arms sales to Iran. Bringing those charges against Weinberger and the five others Bush pardoned was Lawrence Walsh, the independent prosecutor who investigated the Iran-Contra affair for seven years. "The Weinberger pardon marked the first time a President ever pardoned someone in whose trial he might have been called as a witness," Walsh wrote in a scathing 1993 final report on his investigation, "because the President was knowledgeable of factual events underlying the case." Bush issued the pardons contending that Walsh's investigation amounted to the "criminalization of policy differences." The independent prosecutor's quarrel with Bush was not limited to the pardons, which effectively scuttled Walsh's investigation just as Bush was leaving office. As Walsh wrote in response to the pardons, Weinberger's notes revealed "evidence of a conspiracy among the highest-ranking Reagan administration officials to lie to Congress and the American public." Walsh also pointed to what he labeled Bush's "misconduct" for having failed to turn over to the investigation until December 1992 a campaign diary begun in 1986 containing what the special prosecutor called "highly relevant contemporaneous notes" regarding the Iran-Contra scandal. That diary was the kind of evidence Walsh had been requesting be turned over since 1986. "Inside the White House," Walsh wrote of Bush in his final report, "it appears (Bush) had little intention of cooperating with the Independent Counsel." Bush had repeatedly insisted he was fully cooperating with that investigation. "I have nothing to explain," he told the Los Angeles Times three months before relinquishing his campaign diary. "I've given every bit of evidence I have to these thousands of investigators." Bush had publicly insisted he knew little about the Iran-Contra operation, but his diary revealed otherwise. "I'm one of the few people that know fully the details, and there is a lot of flak and misinformation out there," he noted in a Nov. 5, 1986, entry. "It is not a subject we can talk about." But there were others who did want to talk about it. Bush's role in Iran-Contra was perhaps most memorably dissected during a remarkable live interview he did with CBS Evening News anchorman Dan Rather in January 1988. At the time, Bush was still struggling to win his party's presidential nomination and was eager to appear on the nation's most widely viewed TV evening news show to boost his political fortunes. Rather pointedly cited a poll indicating that one-third of Republicans believed Bush was hiding something about his role in the Iran-Contra affair. "I am hiding something," Bush angrily responded. "You know what I'm hiding? What I told the president, and that's the only thing, and I've answered every question put before me." Bush was equally defiant about having gone along with Iran-Contra once he became aware of the operation. "I went along with it, because you know why, Dan? Because I worried when I saw (captured Beirut CIA station chief) Mr. Buckley, heard about Mr. Buckley being tortured to death," Bush told Rather. "So if I erred, I erred on the side of trying to get those hostages out of there." Bush ignored a question from Rather about whether he was concerned about sending missiles to Iran's Ayatollah Khomeini. "This is not a great night, because I want to talk about why I want to be president, why those 41 percent of the people (in a poll of Iowans) are supporting me," Bush told Rather well into the nine-minute heated exchange. "And I don't think it's fair to judge a whole career, it's not fair to judge my whole career, by a rehash on Iran." Rather reminded Bush that as vice president, he had claimed to have been "out of the loop" about Iran-Contra. "May I explain out of the loop?" Bush replied. "No operational role." Bush would go on to win a single term in the White House, years that were dogged by Walsh, the independent prosecutor, trying to get to the bottom of how much the 41st president had known about the arms-for-hostages-for-arms scandal — and how much he had held back evidence of what he had known and when he knew it. Watch PBS NewsHour replays, coverage and clips from a week of funeral services and remembrance for former President George H.W. Bush, or view a gallery of photos. This week, the Bush family has accompanied the coffin of former President George H.W. Bush over thousands of miles by car and by plane. But the final leg of the journey in Texas will be made by train – and no ordinary train. 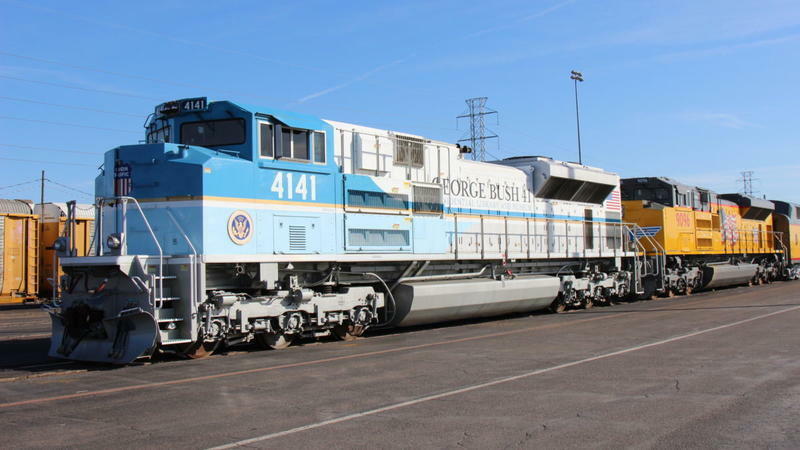 Union Pacific Locomotive 4141 will take Bush's body to College Station, where he will be laid to rest at the George H.W. Bush Presidential Library Center at Texas A&M University. As we've been hearing this week, people have very different memories of the late President George H. W. Bush. Some see him representing a civility that has disappeared from American politics. For others, he's the symbol of indifference to the suffering of many Americans during the AIDS epidemic. 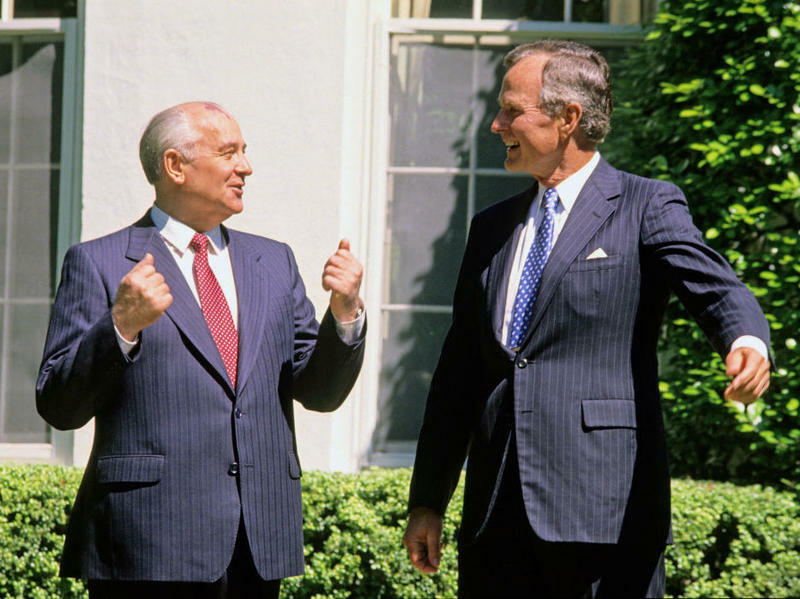 But ask someone from the former Soviet Union about Bush, and they're likely to think of... his legs. Former President George H.W. Bush was remembered as "a great and noble man" by his eldest son, former President George W. Bush, at a solemn but joyous state funeral at Washington National Cathedral. 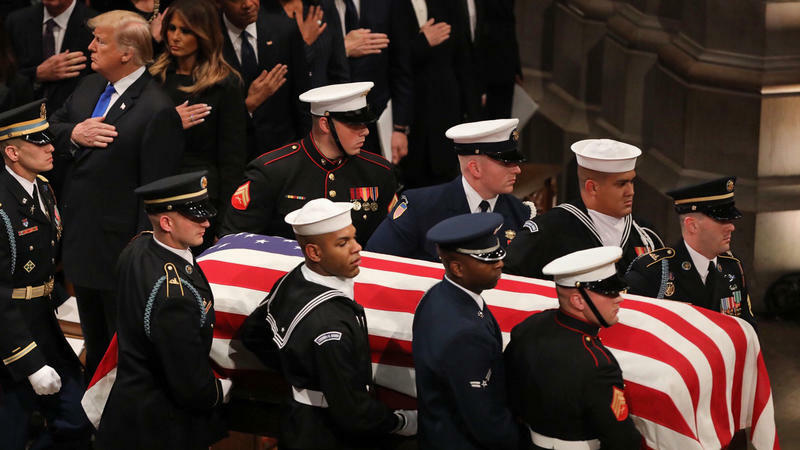 The cathedral bells tolled as the casket containing the 41st president was carried by a military honor guard down the center aisle on Wednesday morning. Seated together on one side of the aisle were President Trump and former Democratic Presidents Barack Obama, Bill Clinton and Jimmy Carter, along with their wives.